Perhaps the most eagerly awaited of all the HMAF toys are Character Options Night Vision Goggles. The HMAF range includes a number of such ‘Tri-Force’ toys as used jointly by the Army, Royal Navy and RAF. 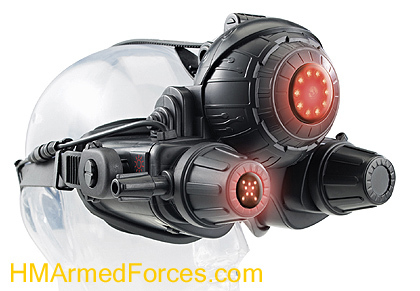 HMAF Night Vision Goggles use technology developed for the military. The hi-tech goggles feature an infrared image intensifier which allows the wearer to see up to a distance of 15 metres in pitch black darkness. 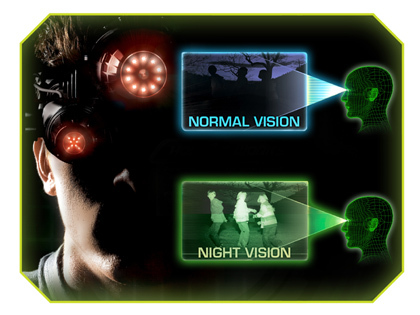 The Night Vision Goggles incorporate a display screen, viewed through the right eye-piece, which can be switched from green to black and white. The left eye-piece has a flip-up cover to change back to normal vision. The HMAF goggles can be operated in two modes. In Maximum Surveillance Mode the equipment emits infra-red light for optimum nightime surveillance. Rotating the viewing knob switches the goggles to Close Proximity Stealth Mode which functions on partial power and makes maximum use of available light. The goggles have adjustable straps on the top and sides, soft rubber eye mouldings and can even be worn over glasses.